Jonathan has an incredibly boring advertising job, a fiance who is a little out of his league, and a NYC apartment on a tenuous perhaps illegal month to month lease. His life changes dramatically when he takes over the care of his Dubai-bound brother's dogs Dante and Sissy. He laughs, he cries, he makes no sense. My affection for Meg Rosoff's new novel knows no bounds, it is pure fun, and a perfect summer read. "Ali Baba trout!" Jonathan Trefoil’s boss is unhinged, his relationship baffling, and his apartment just the wrong side of legal. His girlfriend wants to marry someone just like him—only richer and with a different sense of humor. He doesn’t remember life being this confusing, back before everyone expected him to act like a grown-up. When his brother asks him to look after his dogs, Jonathan's world view begins to shift. Could a border collie and a cocker spaniel hold the key to life, the universe, and everything? Their sly maneuvering on daily walks and visits to the alluring vet suggest that human emotional intelligence may not be top dog after all. 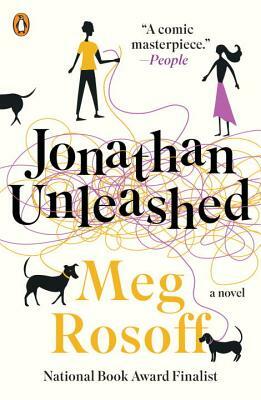 A funny, wise romantic comedy set in Manhattan, Jonathan Unleashed is a story of tangled relationships, friendships, and dogs. Rosoff’s novel is for anyone wondering what to be when they grow up, and how on earth to get there. Meg Rosoff grew up in Boston and worked in advertising for fifteen years before writing her first novel, How I Live Now, which has sold more than one million copies in thirty-six territories. It won the Guardian Children’s Fiction Prize, the Printz Award, was short-listed for the Orange Prize and made into a film. Her subsequent five novels have been awarded or short-listed for, among others, the Carnegie Medal and the National Book Award. The laureate of the 2016 Astrid Lindgren Memorial Award, she lives in London with her husband, daughter, and two dogs.